Optimize your retry schedule and more. Churn Buster is designed to work seamlessly with Stripe Billing. 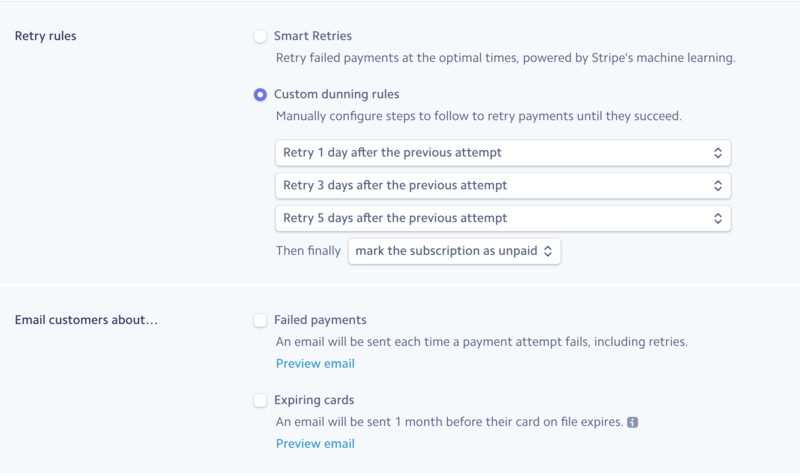 While Churn Buster can add additional retries to your failed payment recovery campaigns, you can still update Stripe retry settings so they work optimally with Churn Buster. No matter what, it's critical to leave subscriptions as Unpaid once Stripe has exhausted all payment reattempts—even if unpaid subscriptions will be canceled when campaigns end. Required: set the "Then Finally" option to "Mark as Unpaid." This allows Churn Buster to run campaigns that are 15... 20... 30 days or more, since the subscription won't automatically be canceled by Stripe prematurely. Churn Buster will not email a customer with a canceled subscription, however, the incorrect setting will abruptly end campaigns after first or second past-due notice. In the worst case, customers who update their payment information will not be billed successfully, as the invoice (and subscription!) will no longer exist in Stripe. If you would like to cancel subscriptions while using Churn Buster, you can choose this option during account setup (or let us know to enable this feature for your account). This will automatically cancel subscriptions when a campaign to recover a missed payment isn't successful. Churn Buster will be inserting additional retries into your recovery campaigns, so we can rely on Stripe to experiment with optimal retries in the first few days. We recommend these settings to be Smart Retries for 1 week, then finally mark the subscription as unpaid. To edit your settings in Stripe, click here. When you're under $20k MRR, it's important to have a predictable retry schedule in-place, that will position a couple retries before Churn Buster sends the first email in your campaign, so we can recover soft-failures without emailing. We recommend retry settings of 1 day, 3 days, 5 days, then finally mark the subscription as unpaid. To ensure the best customer experience, please uncheck the "Failed Payments" and "Expiring Cards" checkboxes. 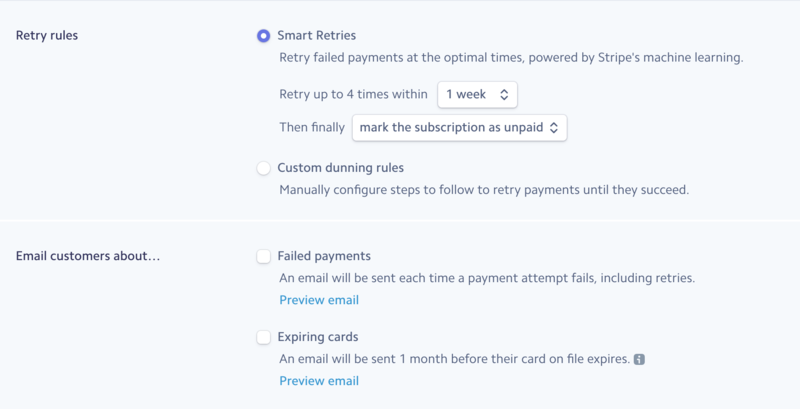 Churn Buster runs optimal campaigns for failed payment recovery, so you won't need these settings enabled (or any other automation to message customers).